Tester: Middle Eastern (Lebanese) with slightly straight, fine lashes that are long. "If you are anything like me, you've developed a mascara "wardrobe" - meaning that you have several favorite mascaras to do different things or provide different colors/effects. I was surprised that Stila Lash Visor became one of the most "worn" mascaras in my wardrobe, but it has, and here's why. For someone like me who has length but could always use more volume (and more length! 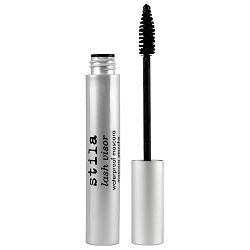 ), in just one coat, Stila Lash Visor gave me great depth, more length, volume and a nice glossy finish on my lashes. I was also able to build it to really get a dramatic effect as well. The consistency is gel-like and slightly wet, so I waited a minute in-between coats to avoid smudging. The mascara wand did a great job of separating and defining my lashes and I loved how it made them look so light, wispy and "feathery". The brush itself is on the smaller and shorter side with densely packed bristles, which easily allowed me to get to all my top and bottom lashes and the inside/outside corners. What I also loved is that it's a great formula for holding a curl. On days when I curled my lashes first and then added the lash visor I loved how well the curl held and lasted all day without flaking or smudging. It's also fully waterproof so it's perfect for swimming and hot, humid days. It's also cruelty free! Add this to your collection now!" - L.A.